January, 2013 … and the Flu! January, 2013, a book to read, some questions to answer … And the flu! “Armed” with my trusty old iBook G4 and the second last dial up internet connection on the planet … it was time to try “Googling”again! It turns out there is some very good information out there … Mostly hidden in between some small scale items used to charge your cell phone or iPod … and some amazing systems even I find too incredibly good to be true … But perhaps … I’m still learning here! 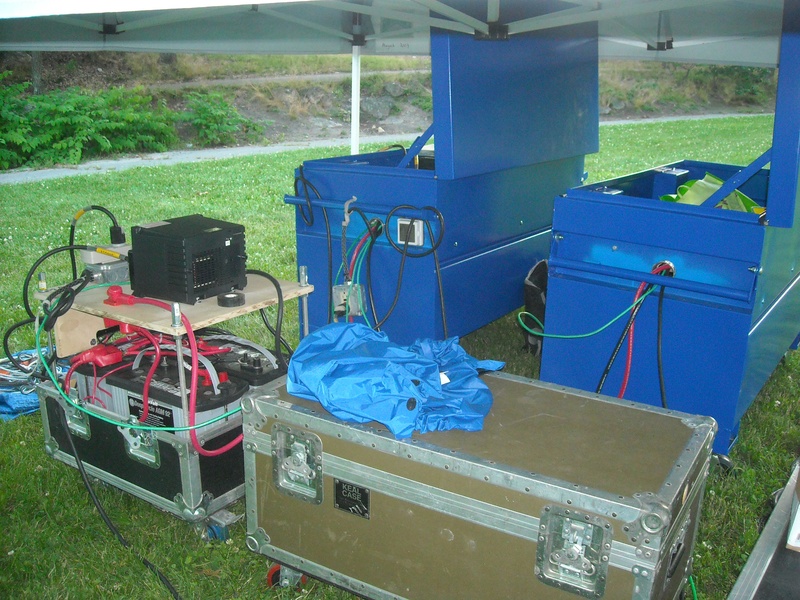 Some nice photos of a couple of portable solar power systems being used at events … But I was not able to find out more. A lot more searching, will get you to the North Texas Renewable Energy Group’s “Solar Shuttle” … A very impressive silent portable power generator … That happens to be solar powered … Wow! They keep redesigning their web site … So you may have to look a bit. This morning (8/25/2014) I found it in the “member projects” page under “The Solar Shuttle solar trailer” link. Wonderful stuff to find, but no help with finding any answers to my questions. … Until Steve Gagnon sent me a link to Handy Bob Solar! Thank you Steve! … And Bob! Bob has been “boondocking” … living off the grid … for years … And had to try a lot of things to get a solar power system to work on his RV. Check out his blog … But start a fresh pot of coffee and get comfortable first … He has a lot to share with anyone willing to take the time. And if you are interested in off grid solar power … find the time. What “Handy Bob” has to say is worth it! A lot of why someone boondocks gets lost as soon as you start up a generator … The peace and quiet of the wide open spaces is easily overwhelmed by even the quietest of internal combustion engines. Bob seems to have his feet firmly on the ground of common sense … And what he was running into trying to set up a working solar power rig for his RV did not seem to follow what his common sense was telling him … It should work … The question was why didn’t it. Backwards from my questions by about 180 degrees … It shouldn’t work … So why is it? My problem was that I was overestimating what was going on … Leaving me with extra power at the end of the day … In the RV world … It seems that underestimating what was going on was leaving a lot of people with not enough power at the end of the day. I have the easier problem to solve. I have learned a lot … And will continue to learn from Bob and the other folks out there who have taken the time (and spent the money) figuring out how to make off grid solar work. Now to put some of those lessons to work! This entry was posted in Outdoor concerts, Solar power, sound system, Uncategorized and tagged Boondocking, Portable, power, solar, web search on August 28, 2014 by zekibeejr.